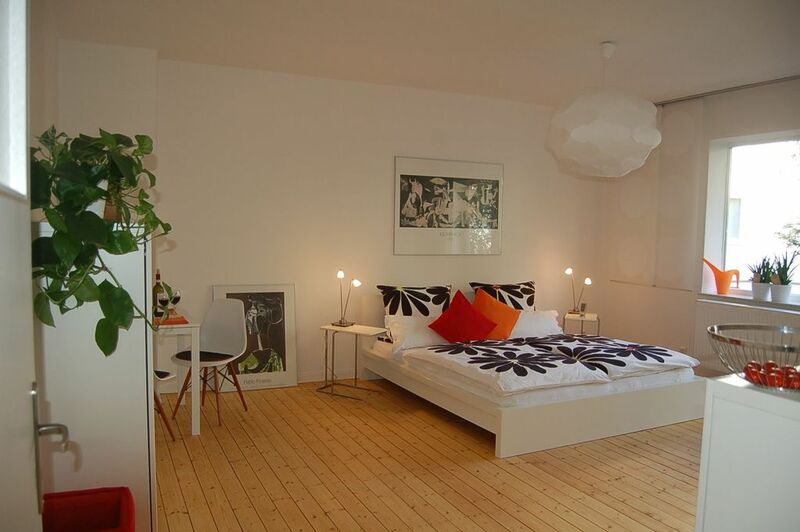 The apartment has two very tasteful and cozy sleeping or Living spaces. Each of these rooms has a comfortable double bed, wardrobe, dresser and a seat or Dining equipped. Also, two bathrooms with shower facilities are available. The modern and fully equipped kitchen is equipped with fridge, stove, oven, dishwasher, Senseo, kettle, toaster and everything you need for cooking and for self-catering. Internet, TV and music system with connections for MP3 players and USB flash drive in each sleeping room, ironing facilities and a parking space for your bikes are of course available. The apartment has got two very tasteful and cozy bedrooms / living rooms, each one with its own balcony, decorated in hot colors and with wooden floors. The comfortable double beds (200cm x 200cm and 180cm x 200cm) Ensure restful sleep. In addition to seating, wardrobe and dresser there is therefore a dining area / workplace in synthesis rooms. The modern and fully equipped kitchen offers everything you need for cooking and self catering Including refrigerator, cooker, oven / microwave, dishwasher, Senseo coffee machine, kettle, toaster and so on. Each room has got its own bathroom. WIFI, TV, music system with connections for MP3 players and USB flash drive in each bedroom are at your disposal as well as iron and ironing board. Bed linen and towels are included so. The apartment was centrally located within walking distance of museums, restaurants, bakeries, the train station, and the center of town in a safe and attractive neighborhood. The photographs accurately represent a lovely apartment with all of the modern conveniences. The owner was a pleasure to deal with. I would highly recommend staying here. Die Wohnung ist sehr bequem, sauber, ruhig und gut ausgestettet. Die U-bahn und Strassenbahn sind sehr nah, und man kann Museen, das Maschsee und die Stadtmitte sehr schnell zu Fuss erreichen. Wir blieben da 12 Tage und wuerden die Wohnung herzlich empfehlen. Die Verbindung mit der Besitzerin ging sehr gut. Hat alles super geklappt, sehr nette Vermieterin. Viele kleine extras u.a. Kaffeepadmaschine inkl. Pads uvm. Sehr schöne große, geschmackvoll eingerichtete Wohnung in zentraler, aber dennoch absolut ruhiger Lage. Netter und unkomplizierter Kontakt zur Vermieterin. War die perfekte Wahl für ein verlängertes Wochenende in Hannover! Wir hatten ein sehr schönes Wochenende in Hannover. Super Wetter, tolle Gärten und eine sehr gepflegte, saubere Wohnung mitten im Zentrum der Stadt. - Die o.g. Preise gelten außerhalb der Messezeiten. Messepreise auf Anfrage! - 2-Tage-Buchungen nur auf Anfrage und gegen Aufpreis von 10,-€ pro Nacht. - Bei einer Belegung von nur 2 Personen stehen 1 Schlafzimmer und 1 Bad zur Verfügung. Werden beide Schlaf-/Badezimmer gewünscht, berechnen wir 25,-€ pro Tag extra. - Anreise zwischen 15.00 und 21.30 Uhr, die Abreise sollte bis 11.00 Uhr erfolgen.